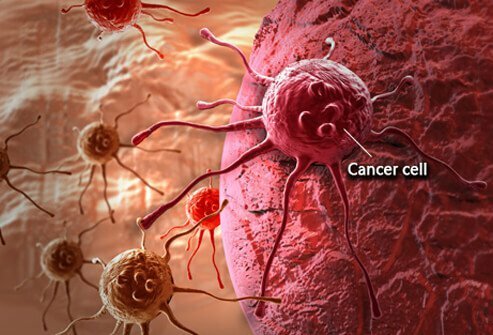 Renal cell cancer occurs when the cells of the kidneys start to grow abnormally. Several different types of cancer can develop in the kidney. Clear cell renal cell cancer (renal cell carcinoma), the most common type of kidney cancer in adults, develops in the tubules (part of the filtering system) of the kidney. There may be no symptoms of renal cell cancer in the early stages. When symptoms of renal cell cancer occur they may include blood in the urine, lower back pain or side pain that will not go away, noticeable lump in the flank, weight loss, fatigue, loss of appetite, fever, night sweats, feeling unwell (malaise), and low red blood cell count (anemia). Symptoms such as a mass that can be felt in the flank, pain in the kidney region, or weight loss are often signs of advanced renal cell cancer. In its early stages, renal cell cancer usually causes no noticeable symptoms. Symptoms may occur only when the cancer grows and begins to press on surrounding tissues or spread to other parts of the body. The symptoms vary considerably from person to person. Some people never develop any symptoms before the disease is discovered; the cancer is found when they undergo imaging tests, such as a CT scan, for another reason. In a study in the Journal of Urology, approximately 53% of people with localized renal cell carcinoma had no symptoms. Symptoms such as a mass that can be felt in the flank, pain in the kidney region, or weight loss are usually signs of advanced cancer. The early kidney cancers are usually asymptomatic, and either detected incidentally while testing for some other condition, or because blood found in the urine, which may or may not be visible to the patient. Other symptoms may result from metastatic renal cell cancer in the bones, lungs, or elsewhere. If the disease attacks the bones, for example, it can cause bone pain, which is deep and achy. Renal cell cancer can also cause a number of conditions called paraneoplastic syndromes. These are problems caused by the tumor when it releases cytokines (chemicals involved with the immune system) or hormones. Cytokines may or may not cause symptoms, and a person may unknowingly have one or more of the following symptoms. Cigarette smoking doubles the risk of renal cell cancer and contributes to as many as one third of all cases. The more someone smokes, the greater the risk is of that person developing renal cell cancer. Obesity is a risk factor. As body weight increases, so does the risk of developing renal cell cancer. This is especially true in women.